Pak-China bus service has temporarily halted its operation between the two countries due to weather condition unfavourable for travelling in Gilgit-Baltistan. 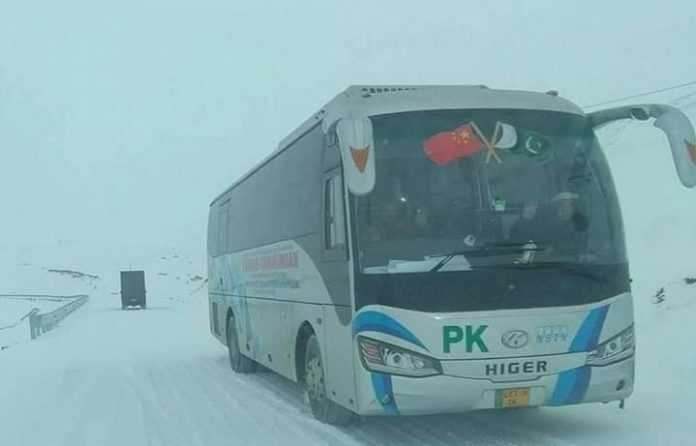 “The bus will not operate between Lahore and Kashgar next week,” said Muhammad Anwar, the CEO of the North-South Transport Service the operator. It was all snowy and landsliding in Gilgit areas till Khunjrab Pass and travelling was impossible in these circumstances, he said, adding the service will resume on turning the weather normal. He said passengers were already informed about the situation. The historic bus service had started its first operation on November 5 and it successfully completed its several journeys between the two destinations during last two weeks. The bus runs from Lahore to Kashgar four times a week — Saturdays, Sundays, Mondays and Tuesdays. It brings passengers from the Chinese city to the provincial capital on Tuesdays, Wednesdays and Thursdays. A one-way ticket for the bus service costs Rs13,000 and a return ticket is at Rs23,000. A passenger is allowed baggage up to 20 kilograms. Apart from the bus ticket, the passengers have to carry valid visa and. The bus takes 30 hours to complete the distance between the two cities. Passengers are served food and tea on different designated places.